1Department of Medical Laboratories, College of Applied Medical Sciences, Qassim University, SAUDI ARABIA. 2Department of Basic Health Science, College of Applied Medical Sciences, Qassim University, SAUDI ARABIA. 3Department of Optometry, College of Applied Medical Sciences, Qassim University, SAUDI ARABIA. Introduction: Crocus sativus is a member of iridaceae family and its use in health management is in practice since ancient time. Additionally, research based on clinical trials and animal models have advocates its role in disease cure without any severe adverse complications. The aim of this study is to summarize the study of saffron and its ingredients based on in vivo and in vitro and role in disease cure and prevention. Materials: This study was designed through the search engines such as Pub Med, Scopus and Google Scholar. The keywords used for the search were mainly focused on Saffron with health benefit and its therapeutics role in different diseases. Result: Saffron stigma is mixture of various components and recent studies have proven that saffron and its active ingredients play a key role in disease management. Moreover, clinical trials based study on the use of saffron and its individual components have confirmed the health promising effects. Conclusion: Although Saffron has potential role in the disease cure and prevention via modulation of anti-oxidant, anti-inflammatory, anti-tumour, anti-microbial and anti-diabetic activity. 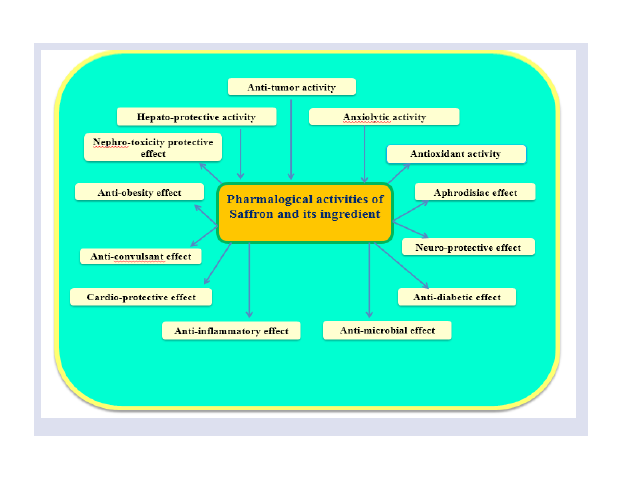 Furthermore, advanced research is needed to elaborate the role of saffron in health management and its mechanism of action in the modulation of biological activities. Keywords:Anti-inflammatory, Anti-tumour activity, Antioxidant, Crocus sativus, Toxicity level. Rahmani AH, Khan AA, Aldebasi YH. Saffron (Crocus sativus) and its Active Ingredients: Role in the Prevention and Treatment of Disease. Pharmacognosy Journal. 2017;9(6):873-879.